This website is a site operated by Osprey Publishing Ltd (part of Bloomsbury Publishing Plc). (“We”) are registered in England and Wales under company number 3471853 and have our registered offices at Kemp House, Chawley Park, Cumnor Hill, Oxford, OX2 9PH, which is also our main trading address. Our VAT number is GB 215039103. Please read through the following Terms & Conditions of Sale and Purchase (“Terms”) carefully. They comprise the terms on which you are permitted to purchase items Osprey Publishing (part of Bloomsbury Publishing Plc) (“Osprey”. “us”, “we”) on this website (the “Website”). If you wish to purchase any item for sale on this Website (the “Product”), you must submit our completed order form. Your order will not be accepted unless you place us in a position of being able to receive full payment for our order at the time we accept it. If we agree to accept your order, we will confirm this by email (the “Confirmation”) and will supply the items you have ordered to you in accordance with the Confirmation and with these Terms. The sale and purchase of Products via this Website will be governed by a contract between you and us formed when you have placed an order. We have accepted your order when we have sent you Confirmation of this (the “Contract”). Please note, as soon as we confirm your order it will enter our electronic system and we will be unable to prevent it being dispatched to you. You acknowledge and agree that, in entering into a Contract, you do not rely on, and have no remedy in respect of, any statement, representation, warranty or understanding (whether negligently or innocently made) of any person (whether party to the Contract or not) which is not expressly set out or referred to in the Contract. This is not intended to limit or exclude liability for fraud on our part. (b) the colour of the items on this Website may vary from the Products supplied to you under the Contract. You have the right to cancel this Contract from the date on which we send you our Confirmation until 14 days after the day you receive your order. Please refer to our Returns and cancellations for more information. Please note that if you have purchased an ebook from this website, and have successfully downloaded it, we are unable to offer a refund on your purchase. If you are unhappy with any Product you purchased from the Website for any reason, you may return it to us in its original condition within 14 working days. If you wish to return an item please follow our Returns and cancellations instructions. Any refunds made pursuant to these Terms will be a refund of the price actually paid by you for the relevant Product and, except where specifically provided otherwise, will not include a refund of any postage, packaging or similar costs. For the avoidance of doubt, if you purchased a Product at a discount, we will refund you the discounted price. Unless explicitly stated (for example, with membership discounts), where a variety of discounts apply (through promotional offers and/or personal discounts available to you) only one discount can be used against each Product. The Website will automatically apply the most advantageous discount to you, provided you enter all discounts to which you are entitled on the order form. We reserve the right to revise the price of any items on this Website without notice. We also reserve the right to refuse to supply you, whether you are an individual or company, for whatever reason. Purchased eBooks are licensed to you only, and should not be shared with a third party or uploaded to websites and/or file-sharing networks. From 1st January 2015 the VAT Rates for digital services (including eBooks) will vary depending on the location of the customer* (*EU based customers only). The table below shows the VAT rates charged by Bloomsbury Publishing Plc via our website Bloomsbury.com on digital services (including eBooks) dispatched to EU destinations. The VAT rates below are not applicable to physical print volume book sales or any other print content distributed by Bloomsbury. The stated price of digital services (including eBooks) is inclusive of any applicable VAT. Sales of digital products and services will be calculated based on the location of the EU customer and not the location of Bloomsbury as the supplier. For customers based outside the EU the VAT rates charged by Bloomsbury will remain unchanged. This is applicable to purchases made only on, or after, 1st January 2015. Note: For customers based in Liechtenstein and Switzerland, a VAT rate of 8% will be charge by Bloomsbury for digital products and services (including eBooks). For more information on the matter please visit HMRC. If you choose, or are provided with, a user identification code, password or any other piece of information as part of our registration and security procedures, you must treat such information as confidential and you must not disclose it to any third party. We have the right to disable any user identification code or password, whether chosen by you or allocated by us, at any time and terminate your registration at any time without notice to you if in our opinion you have failed to comply with any of the provisions of these Terms & Conditions. You are responsible for making all arrangements necessary for you to have access to the Website. You are also responsible for ensuring that all persons who access the Website through your internet connection are aware of these Terms & Conditions and that they comply with them. Please note that we currently support the following browsers: Internet Explorer 9, 10, and 11; Chrome (latest version, as it auto updates); Firefox (latest version, as it auto updates); and Safari (latest version, as it auto updates). You must retain all copyright and other proprietary notices appearing on the Website and you must not use any part of the materials on the Website for commercial purposes without obtaining a license to do so from us and/or our licensors. If you wish to make use of any material on our site other than that set out above, please address your request to info@ospreypublishing.com. If you print off, copy or download any part of the Website in breach of these Terms & Conditions, your right to use the Website will cease immediate and you must, at our option, return or destroy any copies of the materials you have made. You hereby expressly agree that you use the Website ‘as is’ and at your own risk and that any damage or loss arising from your use of it and/or any reliance placed on its content are your sole responsibility. Any material you submit or upload to the Website will be considered non-confidential and non-proprietary, and you grant us a non-exclusive, perpetual, royalty-free, worldwide license to publish such material in any format, including without limitation print or electronic format and to use, copy, distribute and disclose to third parties any such material for any purpose. We also have the right to disclose your identity to any third party who is claiming that any material posted or uploaded by you to the Website constitutes a violation of their intellectual property rights, or of their right to privacy or that it is defamatory of such person. We will not be responsible, or liable to any third-party, for the content or accuracy of any materials posted by you or any other user of the Website. You must use this Website only for lawful purposes and in a way that does not infringe the rights of, restrict or inhibit anyone else's use and enjoyment of the website. Prohibited behaviour includes harassing or causing distress or inconvenience to any person, transmitting obscene or offensive content or disrupting the normal flow of dialogue within the website. Post disruptive, offensive or abusive content: harassing, abusive, threatening, harmful, obscene, profane, sexually oriented, racially offensive or otherwise objectionable material is not acceptable. You must not misuse the Website by knowingly introducing viruses, trojans, worms, logic bombs, spyware, adware of other material which is malicious or technology harmful or designed to adversely affect the operation of the Website or of any computer software or hardware relating or connecting thereto. You must not attempt to gain unauthorised access to the Website, the server on which the Website is stored or any server, computer or database connected ot the Website. You must not attack the Website via a denial-of-service attack or a distributed denial-of-service attack. If you have any concerns about material which appears on our site, please contact marketing@ospreypublishing.com. Thank you for visiting our Website. Whatever you have to say, it is likely that there is someone out there who will benefit from your personal first-hand experiences, knowledge and opinions. Share them all—good or bad—and include as many facts and details as you can. Be constructive. If you’ve had a poor experience, tell us why. Be specific about what it was that didn’t work and not only will other users take you more seriously, but the business or professional involved is much more likely to listen up and improve. When applicable, please only write reviews based on your own personal experience and only submit content that you know to be accurate and fair. Be courteous. We are a diverse community of people with diverse opinions. Speaking to and about people with respect means that everyone feels free to have their say. If you see abusive content or material that violates these guidelines, report it via email to marketing@ospreypublishing.com. Stay safe. Be wise about the personal information you share when you’re using publicly accessible parts of the Website. Setting up and using a fake profile to submit content, especially to promote your business or criticise another business, is absolutely not permitted. If you misrepresent who you are, claim false credentials or expertise, give potentially harmful advice or mislead people in any other way you could be breaking the law—take a look at point 5 below. The Website is not the place for threats, personal attacks, aggressive comments or hateful, bigoted or racist speech. We are a community of people with diverse beliefs, opinions and backgrounds, so please be respectful. Abusive content is absolutely not permitted and will not be tolerated. We want to keep things clean, which means no swear words, no vulgar comments, no sexually explicit language or images and no lewd propositions. Any obvious advertising references found in reviews, comments or other content will be deleted immediately. It is not permitted to post links, HTML, provide phone numbers, email addresses or to provide information that is unrelated to the topic in order to solicit personal or financial gain. It’s also forbidden to send bulk messages or submit any other unauthorised content with the purpose of promoting your business or product. We are committed to doing everything we can to protect the Website from fake reviews. On the rare occasion that we do find bogus content, spam, fake reviews or submissions from fraudulent profiles, we remove them immediately. If you are a business owner, commissioning reviews violates the EU Unfair Commercial Practices Directive (UCPD), and the UK’s implementation of the UCPD. This means companies and sole traders cannot pay someone else to post reviews or write blogs about their own companies without fully disclosing the fact. Both civil and criminal penalties are possible. We do not edit the content of reviews, comments or other user-generated content on the Website. However, we reserve the right to remove content that we determine to be inappropriate and/or in violation of the Website community guidelines or the Terms & Conditions. Depending on the level of offence, violating the community guidelines may result in the termination of your Website account without warning and the passing of any information to the police. In order to subscribe as a member of this website or post messages on any of our blogs or forums, you need to register your details with us. On registration, you must provide us with accurate and complete registration information and it is your responsibility to inform us of any changes to that information (to your email address in particular) by updating your details in the My Osprey section. Your registration does not in itself entitle you to purchase goods from us or become a member and we are not obliged to accept any applications or orders that you place with us. The membership is for a minimum of a year and may be purchased by debit or credit card only. We use the personal and transactional information (e.g. name, address, e-mail address, credit card details) you supply to us in order to process your membership application. When you click "Submit Order" to submit your application on-line you are making an offer to take out a membership which if accepted by us, will result in a binding contract. When submitting your application on-line your credit/debit card will be debited when you click "Submit Application". You will receive an email acknowledging that your application has been received successfully and is being processed, the contract between us is formed at this point. We reserve the right not to accept or process your application for any reason. 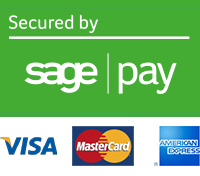 All applications are subject to validation checks and authorisation by your payment card issuer. If we do not accept your application and your credit/debit card has already been debited, we will notify you and refund your card in full immediately. All members are entitled to access the Osprey Databases on our website in accordance with these Terms, with the exception of Bronze members. Your membership entitles you to a discount on all our books, with the exception of Bronze and Trial (free Day Pass) Memberships. This discount varies dependent on your membership package. 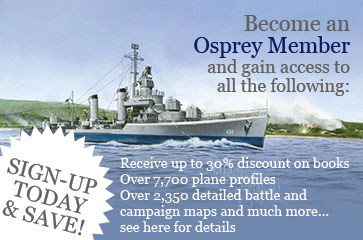 The discount rates available to members are displayed on the Osprey Membership page. The appropriate discount is automatically applied to the basket in the checkout process once you are logged in. Bronze Membership grants the user commenting privileges on Osprey blogs and forums. Gold and Silver Members also receive commenting privileges. The membership subscription fees displayed in the Members section of the website will prevail at all times. We reserve the right to increase our membership fees at any time after the first year of your subscription has elapsed. We will notify you of any such fee increases by email. You have 14 days from the date of the notification to cancel your subscription if you do not want to pay the increased price. Although we try to ensure that all membership fees are accurate, errors may occur. If we discover an error in the membership fee, we will inform you as soon as possible. You will have the option of reconfirming your application for membership at the correct price or cancelling it. We will refund you in full if you cancel the application and have already paid. If we are unable to contact you, we will treat the application as cancelled. Your debit or credit card will be billed either monthly or annually depending on your choice of membership. Monthly members pre-pay on a monthly basis until the subscription is terminated in accordance with clause 5 (“Termination of membership”). Annual members pre-pay on an annual basis until the subscription is terminated in accordance with clause 5 (“Termination of membership”). From the date membership is granted you have 7 working days to cancel your contract with us. Cancellation after such time will not result in a refund or credit, except in accordance with our termination provisions in clause 5 (“Termination of membership”). Annual memberships will be automatically renewed for one year on the anniversary of the annual membership. An e-mail billing confirmation will be sent to the member, who will have 14 days from the date of the billing confirmation to cancel or change the membership, and obtain any corresponding refund or credit. No refunds or credits are granted for any changes or cancellations requested after that 14 day period. Any refund will be in the form of a credit to the debit or credit card account to which the membership was originally charged. We may terminate or suspend your membership at any time and in any event. Upon termination or expiration of your subscription, you must immediately cease using the Osprey Databases. Where we terminate your membership through no fault or breach of condition by you, you will be entitled to a refund of any subscription payments made to us for membership after the date of termination. If your membership payments are made on a monthly basis, you may cancel your membership contract at any time after your first complete year of membership by giving our customer services team one month’s notice in writing. If your membership payments are made on an annual basis, you may cancel your membership contract at any time after your first complete year of membership by giving our customer services team one month’s notice in writing. You will not be entitled to a refund for any outstanding months remaining within your annual membership.